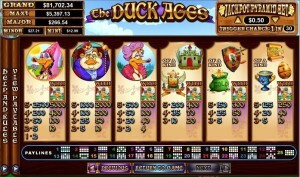 The Duck Ages is one of the Nuworks creations. 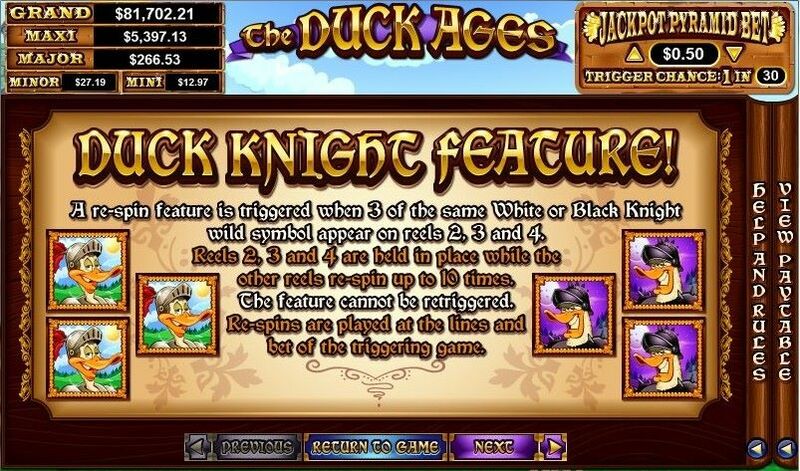 It’s not only a Medieval themed game, but also one where ducks are the heroes. Very similar characters are used in animation series called The Duck Tales, so I assume it was at least partially inspired by them. The game looks absolutely fantastic to play on, and I’m a big fan of this kind of drawing style when used in cartoon style slot machines. 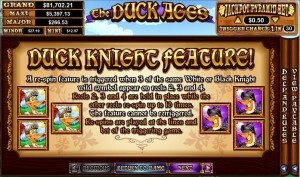 Players which try out The Duck Ages will discover a 5 reel slot machine, 25 paylines and features that will give you bonus games, free spins, regular and stacked wilds, scatters and multipliers. It also offers a $5,000 top payout. 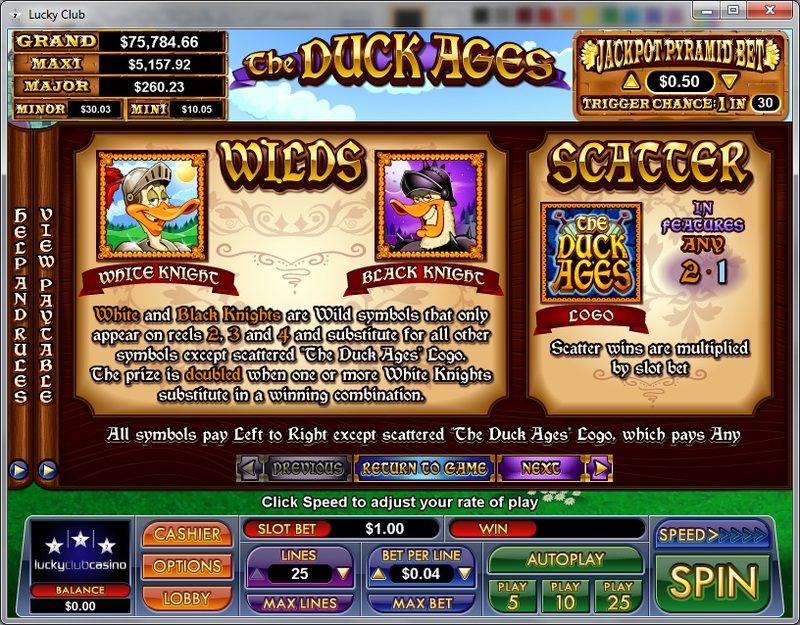 The Duck Ages has two types of wilds for you, a scatter symbol and the re-spin feature. The White Knight looks like the good guy, while Black Knight is more the bully sort. Both symbols are used as wilds in the game, and they both appear on the 2nd, 3rd and 4th reels. They can substitute for any other regular icon that’s trying to be part of another combo. If a White Knight takes part in the formation of a new combo, you are given a 2x multiplier for the resulting prize. The Black Knight has no such thing. The other symbol that Duck Ages has in store for you is the Logo, the scatter icon. The prize it offers is worth the same as the bet of the round, and it’s given for two scatters present on the reels. This is the feature which brings you re-spins, and the requirement for it to start is to have three wild symbols on the middle three reels (2, 3 and 4). It has to be three wilds of the same type, it doesn’t accept a mix of White and Black Knights. With the three wilds in place on those reels, you will find that they are held in place, with only the 1st and 5th reels re-spinning for up to 10 times. 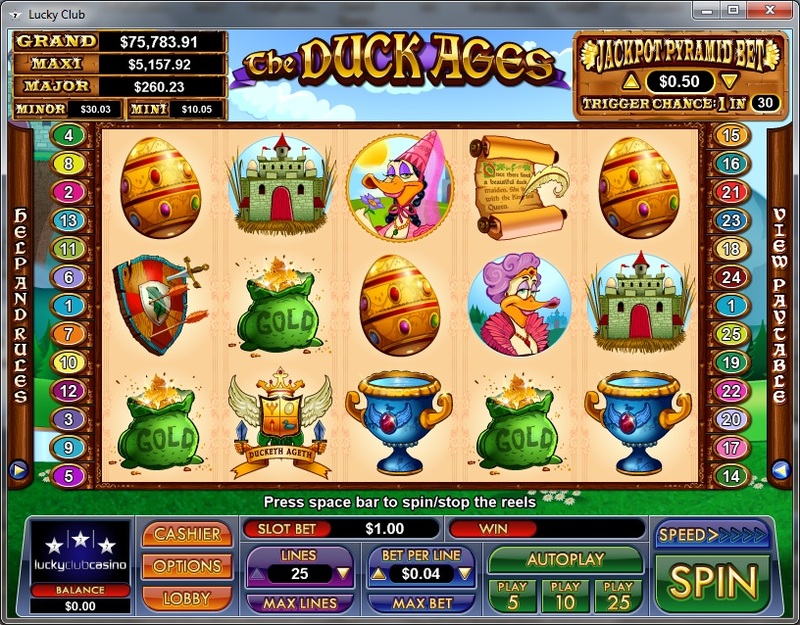 The Duck Ages Logo is responsible for starting up the free spins. While two scatters will only give you a small prize, 3 will bring you 10 free spins, 4 will trigger 25 and the maximum of 5 will have 125 free spins for you. 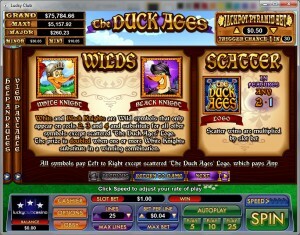 The two wild symbols appear stacked for the duration of the free spins. You also get double the usual prizes while these games are used. If you want to give this game a chance, you can start spinning reels with just one coin, but you should wager 25 of them if you want all the lines to be active. For each coin, the denomination goes from $0.01 to $1, so you can spend up to $25 on a single bet. 5,000 coins, or up to $5,000, is the top payout which you can win inside. 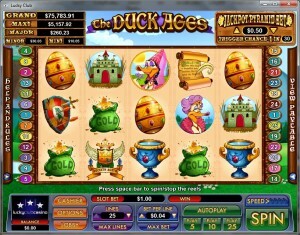 The presence of five progressive jackpots adds to the potential of the slot as well, but they are randomly triggered, so the symbols of the slot have nothing to do with them. The design of the game is one of the best things it has to offer. The Duck Tales style characters and drawings are of excellent quality. Besides the duck characters, you also get Faberge eggs, castles, shields, drinking cups, gold bags and so on. As you will find out yourself, it’s a pleasure to play the slot. Symbols: White Knight (wild), Black Knight (wild), Game Logo (scatter, 1x bet), Duck Princess (2,500 coins), Duck King (1,000 coins), Duck Queen (500 coins), Castle (200 coins), Duck House Logo (200 coins), Gold Bag (150 coins), Shield (150 coins), Goblet (125 coins), Faberge Egg (125 coins) and Scroll (125 coins). It’s one of my favorite games from the Nuworks collection, mostly because of the graphics, but also thanks to the features which were included. The payouts are on the average side. 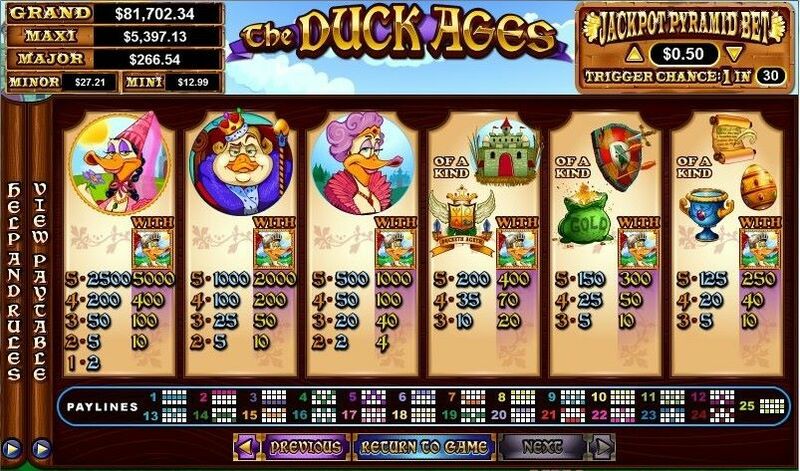 This The Duck Ages slot is offered by all online casinos with NuWorks software, playable either in practice or in real money mode.